“Jammin’ with Jamie” Theme: “Marvelous Muppet Melodies”! I survived my third Dance Marathon (nudm.org)… only to immediately get very, very sick at one of the worst times possible (not that there’s ever a good time to get sick!). 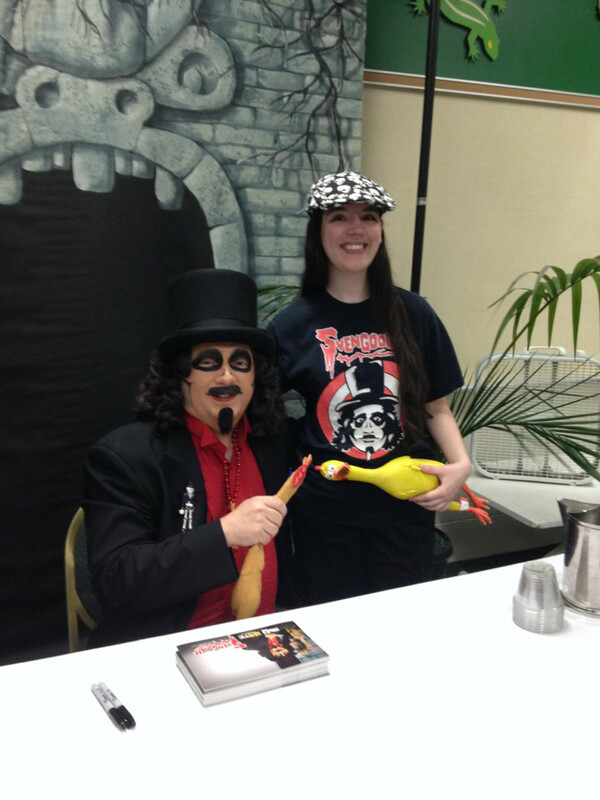 On the bright side, I met Svengoolie (Svengoolie.com) again at the Brookfield Zoo AAZK Spaghetti Dinner (BrookfieldZoo.org), benefitting Vital Ground! But after a couple of weeks off, we’re back to jammin’, and my goodness, do we have a great theme to jam to this week! I’m going to be honest: I’ve wanted to do this theme for a while, but I wasn’t sure how to tie it into a current event or season, and I also wasn’t sure how it would go over with my fellow Jammers. But now, not only do I have the perfect current event tie-in, but I’ve also been jammin’ with all of you long enough to realize that this is right up our (awesome) alley! That’s right, fellow Jammers, this week, the magnificent Muppets are taking over our jam session! (Well, in a figurative sense, anyway!) This is, of course, to celebrate the recent opening of the Muppets’ latest theatrical film, Muppets Most Wanted! So far, the tunes we’ll be jammin’ to this week come courtesy of artists such as Kermit the Frog, Gonzo the Great, Miss Piggy, Dr. Teeth and the Electric Mayhem, and many, many more! Certain selections come from Muppet films, Muppet television shows and appearances, and more! I hope you consider jammin’ with us this week in what will be our “most sensational, inspirational, celebration-al, Muppet-ational” jam session ever! If you’d like more information about the show and how you can tune in and jam with us, you can find everything you need right here! This entry was posted in 89.3 WNUR FM, Disney, Jammin' with Jamie, Movies/Film, Music, Northwestern University, Radio, Television/TV, The Muppets and tagged Marvelous Muppet Melodies on March 31, 2014 by Jamie Lee.